With a total of 12,000 troops and over 500 pieces of equipment marching through the Tiananmen Square and nearly 200 military aircraft roaring across the sky, China concluded its massive military parade commemorating the 70th anniversary of the victory of the Chinese People's War of Resistance Against Japanese Aggression and the World Anti-Fascist War in Beijing on September 3. It was the perfect opportunity to show the world how far the country has come since a costly victory won seven decades ago, in addition to how far the country is willing to go to preserve its hard-won peace and prosperity. In his speech at the commemoration, Chinese President Xi Jinping said that the parade is a tribute to history and a call for peace honoring the Chinese who perished and those who contributed to victory in the deadly war against Japanese aggression. "The experience of war makes people value peace all the more. The aim of our commemoration is to bear history in mind, to honor all those who laid down their lives, to cherish peace and to open up the future," said Xi, also Chairman of the Central Military Commission and General Secretary of the Communist Party of China (CPC) Central Committee. The participation of countries from Oriental, European and Pacific battlefields during World War II (WWII) made the military parade in China a major international occasion. Along with Xi, 23 heads of state, including Russian President Vladimir Putin and Republic of Korea President Park Geun Hye, watched the parade. Former British Prime Minister Tony Blair and former German Chancellor Gerhard Schröder were also present. Attendees also included government representatives and heads of international organizations, including UN Secretary General Ban Ki-moon. 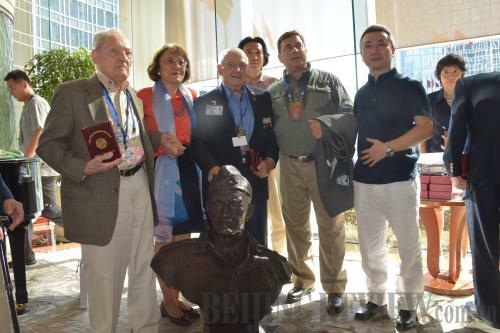 In addition, more than 100 foreign VIPs or relatives of wartime heroes attended the event, including relatives of Canadian doctor Norman Bethune, who achieved fame in China owing to his service as a battlefield surgeon in the CPC-led Eighth Route Army, Japanese veterans who served in same army, and veterans of the Flying Tigers, the nickname given to the American Volunteer Group, the air corps that fought alongside the Chinese during WWII. "The invitation of WWII veterans from other countries is a way for China to extend its solemn gratitude and tribute," said Peng Guangqian, Deputy Secretary General of the Council for National Security Policy Studies, a research institution based in Beijing. Meanwhile, nearly 1,000 troops from 17 countries also participated in the parade. It was the first time that foreign troops had been invited to participate in such an event. Foreign formations were from Belarus, Cuba, Egypt, Kazakhstan, Kyrgyzstan, Mexico, Mongolia, Pakistan, Serbia, Tajikistan and Russia. Delegations from six other countries, namely Afghanistan, Cambodia, Fiji, Laos, Vanuatu and Venezuela, also marched in the parade. The troops joining the parade came from Asia, Europe, Africa, Oceania and Latin America, covering all the main battlefields of the war. All of the participant countries suffered greatly in the conflict. Among them, Egypt, Russia and some members of the Commonwealth of Independent States carried on bitter struggles against the Axis troops and suffered tremendous casualties and losses. Experts and politicians believe that the presence of international representatives indicates universal acknowledgment of China's long-ignored contribution to the Asian battlefield during WWII, as well as China's rising global status. Ban said ahead of his Beijing trip that the international community recognizes China's contribution and sacrifices in WWII, and that it is very important now for the world to learn from past lessons and look forward to the future in order to build a better world. A number of WWII Allied countries, including the United Kingdom, the United States and France, sent their government and diplomatic representatives to the event. Qiao Liang, a professor with the National Defense University of the People's Liberation Army (PLA), said the participation of foreign armies will remind people that WWII victory was won through the efforts and sacrifice of many countries. "The Chinese people will always remember what the people of other countries did for the victory of the war of resistance," Xi said in his speech. According to Xi, the best way to honor the heroes who gave their lives to uphold freedom, justice and peace and to mourn the loss of innocent lives brutally taken during the war is to make sure that this historical tragedy will never repeat itself. "Seven decades ago, peace-loving countries across the world joined forces in the fight against fascism and achieved victory. Today, it also needs the joint efforts of all people to safeguard justice and peace," Qiao said. Qu Rui, Deputy Chief of the Operations Department of the General Staff Headquarters of the PLA, said that victory in the Chinese People's War of Resistance Against Japanese Aggression was not only a victory for the Chinese people, but also for people around the world. "The participation of foreign formations, representative teams and military delegations manifests the international nature of the war. We firmly believe that the commemoration activities will cement trust between the PLA and foreign troops participating in the parade," he said. Zhao Qizheng, former Minister of the State Council Information Office, said that cooperation between China and other countries in WWII has long been remembered. "With new cooperation in process, we, the global family, can create a brighter future together," he said. In a written interview with Xinhua News Agency, Schröder said China made a very important contribution to the victory in WWII, one little known to Europeans. "When people in Europe talk about WWII, the main focus is usually on their own continent. Few people there know specifics about how WWII also raged in Asia and how fascism also brought terrible suffering to the Asian people," Schröder said. China was the first country in the world to fight against fascist forces when Japanese troops began their invasion of northeast China on September 18, 1931. Japan initiated full-scale aggression in China in 1937. By the end of WWII in 1945, more than 35 million Chinese soldiers and civilians had been killed or wounded. Japan signed its formal WWII surrender on September 2, 1945, and China celebrated its victory the following day. "The victory of the Chinese People's War of Resistance Against Japanese Aggression is the first complete victory won by China in its resistance against foreign aggression in modern times," Xi said in his speech. "This great triumph opened up bright prospects for the great renewal of the Chinese nation and set our ancient country on a new journey after gaining rebirth," Xi said. "I think commemorative events have their place," said Odd Arne Westad, ST Lee Professor of U.S.-Asia Relations at Harvard University. "If the end of WWII teaches us anything, it is that we have to avoid war in the future. In total wars, there are no winners, only losers," he said. During the military parade, China displayed a host of new armaments ranging from intercontinental ballistic missiles to medium-long range bomber aircraft. Twenty-seven phalanxes with Chinese-made main battle armaments including the DF-5B, an intercontinental strategic missile designed to carry nuclear warheads, and the DF-21D anti-ship ballistic missile described by some media as the "carrier killer," paraded through the Tiananmen Square as nearly 200 aircraft including the H-6K medium-long range bombers and carrier-based J-15 fighter jets flew overhead. 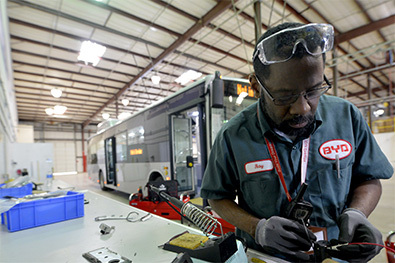 Eighty-four percent of the 500 pieces of equipment of over 40 types on show were being displayed in public for the first time. 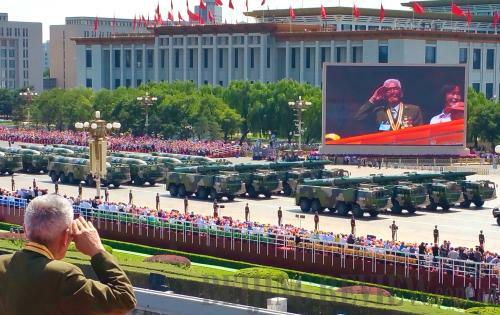 "The new domestically produced weaponry shown in the parade demonstrates the military's modernization and innovation in China," said Ge Lide, an expert on military equipment with the National Defense University of the PLA. China has held more than a dozen military parades on the National Day to mark the country's founding on October 1, 1949. It has typically unveiled its most advanced weapon systems during the parades. Ge said China's military parades have provided great opportunities to showcase development in weaponry and boost military morale. The armaments displayed during China's first parade in 1949 were all from other countries and had previously been used, including a Japanese tank captured by the Chinese army in 1945. Yin Zhuo, Director of the Information Technology Commission of the PLA Navy, said the weapons indicate that the Chinese military is moving from a phase of mechanization toward information technology. Many experts believe that the most emphatic point the parade made is that China is committed to building a strong army as its defensive military policy in nature has remained unchanged. 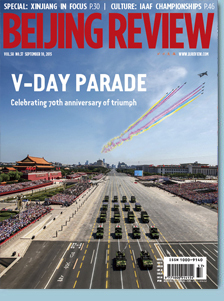 Most of the Chinese aircraft displayed in the parade were multiple-role models that focus on air control. The military parade in 1949 saw only 17 aircraft. Last year, Xi urged accelerating development of military equipment systems to help build a strong army. In 1937, when Japan began its full-scale invasion of China, the number of aircraft that the then weak Chinese air force possessed constituted only one seventh that of its formidable Japanese counterpart. Most of the Chinese warplanes were outdated or had been imported from the West. Qiao with the National Defense University of the PLA said that China learned a tough lesson during WWII: Without a strong army, a country is prone to predation; Without the capacity to stem war, historical tragedies are doomed to happen again. "I'm happy China today has so many advantageous weapons. The situation makes our citizens feel safer," said Yang Suming, an officer with the Beijing General Fire Team who took part in the military parade. "China's armaments are proportional to its level of economic development and its security requirements. 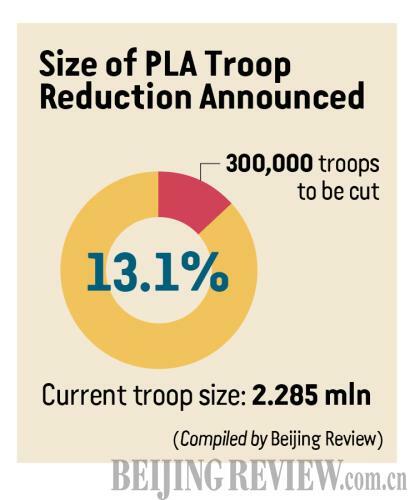 Its military strategy will remain active defense," said Chen Zhou, Director of the National Defense Policy Research Center of the Academy of Military Sciences of the PLA. In his speech, Xi said China will remain committed to peaceful development. "We Chinese love peace. No matter how much stronger it may become, China will never seek hegemony or expansion. It will never inflict its past suffering on any other nation," Xi said. Xi also pledged that China will cut the number of its troops by 300,000 and seek to cultivate the sense of "a community of shared future," a phrase intended to express how countries might benefit from attempting to help one another in the process of pursuing their own individual development.